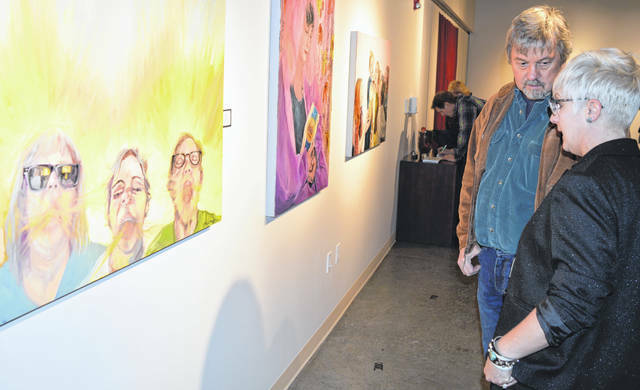 At the opening reception Thursday night for a Faculty Art Exhibition at Wilmington College, Mary Beth Thorngren, right foreground, stands near three of her paintings with a guest. The painting at the left foreground has a theme related to light. 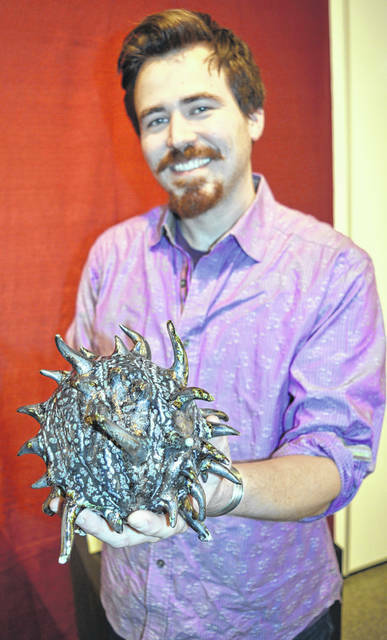 Thorngren is a WC adjunct art faculty member, and also operates Thorngren Studio Arts located in downtown Wilmington. Normal gallery hours for the Faculty Art Exhibition on the college campus now to March 8 are weekdays, from 9 a.m. to 5 p.m., and by special appointment arranged through curator Hal Shunk. 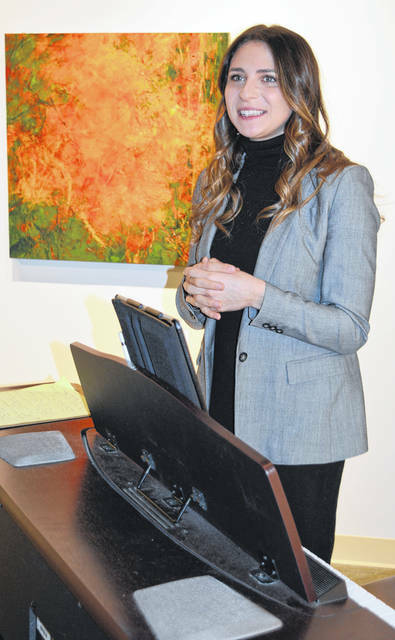 Dr. Brianna Matzke, WC assistant professor of music, performed several pieces on the piano at the opening reception for a Faculty Art Exhibition in Harcum Gallery at Wilmington College. Nicolin Haines holds up a piece of ceramic art that was one of the exhibits on display for a Faculty Art Exhibition at Wilmington College. He said he likes to experiment with different surfaces, including bubbling crater glazes. Note how this piece of artwork has metallic features. His artwork has a lot to do with mutation and adaptation, he said. Haines, who is a son of Michele Carr who had photographic art displayed at the event, attended Wilmington High School before going to Kent State University where he graduated in spring 2017.